Marketers are becoming more innovative in how they get consumers to interact with smart home speakers. 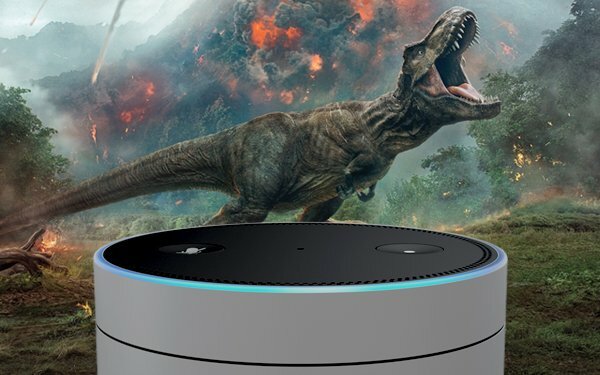 As a promo for “Jurassic World: Fallen Kingdom,” the projected blockbuster movie opening this weekend, an interactive “Jurassic Park Revealed” is being released for Amazon's line of smart home speakers and on Android or iOS via the Alexa app. The interactive audio adventure was created by Universal and Earplay and I’ve been trying out an early test version, finding it to be quite fun. Alexa remains live, awaiting an answer, and the story proceeds down a path based on which answer is given. As a result, the listener is more likely to pay close attention to the story. The story can be stopped at any time and resumed in place later. The Jurassic audio adventure is in six chapters, comprising more than an hour of listening beginning to end. The first chapter is free and then the listener can purchase the time for the rest, $4 for a limited time, with $1 discount for Amazon Prime members. Movies are not alone in bringing more creative interactivity to smart speakers. Aside from the promotional value for movies or TV shows, the personal, interactive approach starts to show some of what’s ahead for smart speakers.